We encourage every school in the Perfect Pollinators Schools’ Red Mason Bee project to create a mini meadow where bees and other insects can feed and build homes. Solitary Red Mason bees are excellent pollinators. It takes up to 120 honeybees to do the work of 1 Red Mason Bee! Why are Red Mason Bees such good pollinators? The answer is very simple. Most bees store the nectar and pollen they collect from flowers in sacks attached to their bodies. Not the Red Mason Bee. As the Red Mason Bee has no storage sacks the pollen and nectar just sticks to its body. Then when it visit other plants the nectar and pollen particles it has gathered drop off its body and pollinate other plants. To be effective pollinators Red Mason Bees need to be able to collect nectar and pollen from wildflowers. If you do not have many wildflowers growing in your school grounds then it is time to create a small mini meadow or plant outside tubs of wild flowers. 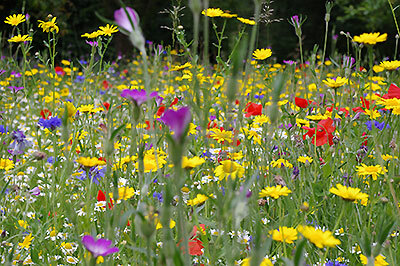 Creating a mini meadow for bees and other insects is easy and is not an expensive option. Just follow the steps below and click on the web links at the foot of the page for more information and guidance. When is the best time to start? The best time to sow your meadow is in spring or late autumn. Choose a suitable area. The area you select need be no larger than a strip 5 by 2 metres. It needs to somewhere open and sunny, but can be flat or sloping. Reduce the fertility. The soil in your school grounds is likely to be too rich for a meadow. The best way to reduce the fertility is to remove the top ten to fifteen centimetres. Dig the soil and get rid of any weeds. Once you have bare soil, lay black plastic over it so that any weed seeds already in the soil germinate and die. Choose your wildlflower seed mix. Good mixes include: cowslip, field scabious, hoary plantain, greater and common knapweed, lady's bedstraw, meadow buttercup, ox-eye daisy, red clover, ribwort plantain, wild carrot, yarrow, bents, fescues and yellow rattle. Sowing your seeds. You need about five grams of seed per square metre of meadow. Just scatter the seed as you walk across the ground. To try and get an even coverage, split your seeds into batches and sow one batch walking in one direction and another batch walking at 90 degrees. Keep it well watered until it has established. The first year. In the first growing season, cut the growth in midsummer and remove all the dead plant heads. Give the meadow a couple more mows during the autumn and maybe once in early spring if required. You may need to do some 'spot' weeding, to remove nettles, dock leaves and thistles. What to look out for in your school meadow! During and after the first year you should see bees and butterflies start to use your meadow and birds should feed there and possibly bats may fly over the top. 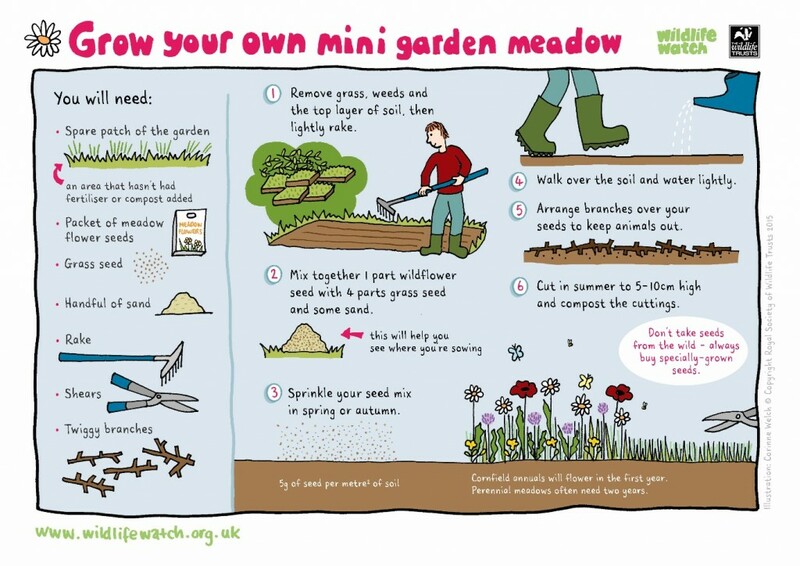 With a bit of good luck and fortune your mini meadow should quickly become one of the most life-filled parts of your school grounds! Friends of the Earth – Free meadow seed offer for schools!